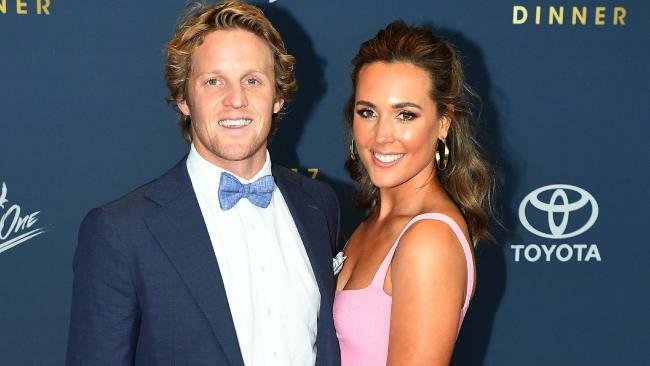 ADELAIDE Crows superstar Rory Sloane has announced the heartbreaking news that his firstborn son was delivered stillborn last week. Sloane and his wife, Channel 7 presenter Belinda Sloane, announced the tragic news with identical social media posts on Thursday where they photographed their hands holding the hand of their newborn, who was named Leo Rory Sloane. "Last week we said goodbye to our beautiful little man," Sloane wrote on his Instagram account. "Leo Rory Sloane was born into the world still, but perfect. "Thanks for making us the proudest parents and filling our hearts with love beyond measure, the moments we had with you are now beautiful memories that will last a lifetime." The 32-year-old midfielder was a surprise omission from the Crows' season-ending game with Carlton last weekend. At the time Adelaide confirmed he missed the game "due to a private family matter". Adelaide wore black armbands during the game. "The Adelaide Football Club confirms Rory Sloane will not play against Carlton tonight due to a private family matter," the Crows said in a statement last week. "The club asks that the privacy of Rory, his wife Belinda and their families is respected at this time." The couple announced their pregnancy in April after Crows captain Taylor Walker accidentally blurted out the exciting news in a radio interview - before Sloane re-signed with the Crows on a massive five-year contract extension. "It's a decision Sloaney has to make," Walker said. "Obviously the great news for him and Belinda is they're pregnant as well, so they're expecting a child. So that's something they'll weigh up in due course." The couple went on a babymoon to Byron Bay two months ago and Belinda was posting excitedly about her "bump" as recently as August 8. According to reports, Belinda was due to give birth in October, two years after the couple were married at Byron Bay in October, 2016. Sloane, from the Yarra Ranges in Victoria, spoke earlier this year about his desire to head back home to be around family when he and his wife planned to welcome their first child. "Bringing up a child away from home is going to be a challenge, but one that we're up for," Sloane told The Adelaide Advertister. "You go around in circles a few times, that's been us. "It has been stressful but it got to a stage where we were like, 'Yep we know, we've got a few things in place, we know the support is here and we love it here'. "We have unbelievable families, great support from them, and all I want as a husband is to make sure my wife is happy and we've got a happy life and we've been incredibly happy here for a long time."